The first and only lantern able to clamp to branches, tents, backpacks, and boats. Perfect for backyard barbeques, lighting workspaces, camping, boating, fishing, and during blackouts. It locks open to stand when there is nothing to clamp to. The head articulates to get light where you need it. It also can be used as a flashlight. 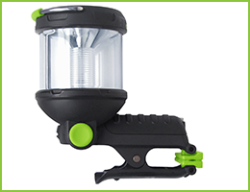 Clamplight Lantern, like no other flashlight in the world. Uses a 2CREE® brilliant white LED's. Uses 2 separate LED's for better optics and ultimate performance. LED's have better color, are longer lasting, and with outstanding quality assurance. Bulb life is virtually forever at 100,000 hours. Hi/Low/Strobe mode for Lantern plus Flashlight mode. Low/Hi lantern power allows just the amount of light you need. Strobe mode for added visibility. Lanturn - Up to 260 lumens of light in high mode, 125 lumens in low mode. Flashlight - Up to 100 lumens of light. Low/Hi flashlight power allows just the amount of light you need. With IC chip for more consistent light output. High to low battery power indicator lights show battery levels. Head pivots to deliver brilliant white light where you need it. Clamps virtually anywhere and stays out of the way versus stand lights like "tripod mounted" or "snake like lights". Clamp converts to a stand light by pressing clamp and sliding lock feature. Non -skid feet swivel down for stability. Positioning "clicks" to assist aligning light. Engineered with High Performance Plastics to be lightweight yet tough. Stainless steel springs and pins for added durability. Rubberized coated for extra grip and durability. Extremely tough polycarbonate lens resists cracking or scratching. Convenient swivel up handle. Meets IPX4 international weatherproof standard.